God that is ugly, well I guess you cant really expect much from them, beyond on what they know and what there use to. It is different, but id rather have a car like the early 90s 21 HPD, You would think they would get of the same stuff already, This makes Porsches 911 Evolution look Incredible. 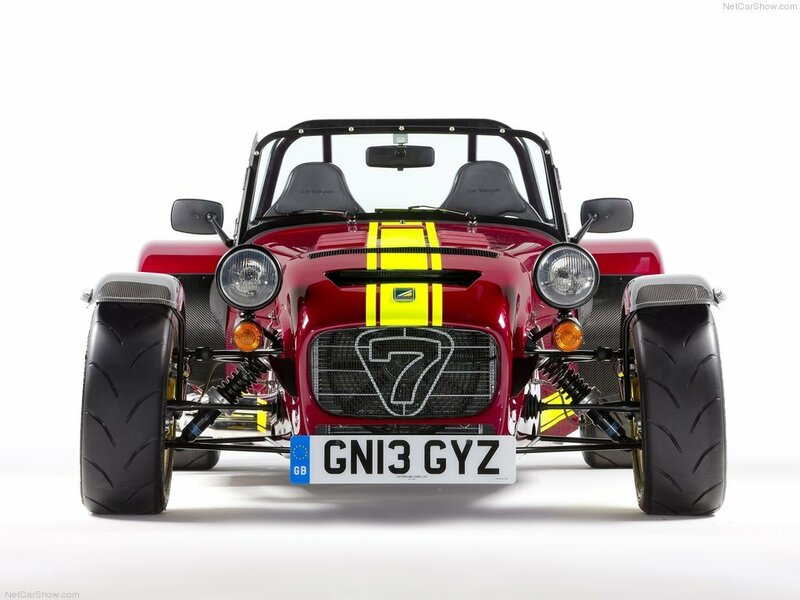 Caterhams are good fun cars with good MPG, but mostly prats drive them, That or people with insanely good automobile knowledge. Other then the interior screen, I don't like anything on this, its too ghastly, That Manual gearbox looks nice though, nice to see that's still strong over here with the TRUE British Marques. Looks straight like mexican vuhl 05. Except, caterham is ugly. @ Mental: That actually looks pretty cool, I like it, I just wish it had at least a windshield. The AeroSeven concept. The future of Caterham's design. The concept is full of electronics and LED lamps everywhere (including 3D monitor), so it weighs 75 kg more than the standard CSR - 635 kg, even though the whole car is fully made of CF. AeroSeven uses 2.0 Duratec engine, which is enough to get 236 bhp @ 8500 and 206 Nm. So the p/w ratio should be close to 400 bhp/tonne. And the power is sent via 6-speed manual to RWD. Two modes are available - Road and Race. Sounds like lots of fun and performance, but 0-100 time doesn't sound too much impressive - 4.0 sec. The body is made to be maximally aerodynamical and downforce (it doesn't even have a windshield! ; thankfully, it's got the mirror!). That, of course, benefits, but I'm not a fan of the modern design. IMO, it looks like a polished soap-box with Christmas lights, kind of awful; Caterham for teenagers... I prefer the classy original Seven. Caterham is considering putting this car to production in 2014. Well, it would be a perfect competitor to the Vuhl 05. That looks to be at least 3 degrees of negative camber. It should have excellent cornering. Caterham and Renault signed an agreement in co-operation and development of new models. Have you ever heard of rumored Alpine successor? Yes, that means Caterham will have its own sportscar based on the Alpine. I guess Caterham's car will be underpowered in comparison to the Alpine, whether Renault is the "chief". But we will see details further. Caterham doesn't do anything new, all there cars look the same, for once I would like to see them change there style, like back in the day when they made the 21 Vhpd. Sure, it will be fun and fast, but 50k is asking a lot, and I think most potential buyers would opt for a Cayman or a 2nd hand GT3. On another note, those are some Seriously sticky tyres.. The ultimate 7. 620R. It replaces the old Superlight R500. But this car is the new step. If the previous one produced 260 horses, this one is boosted up to 310 horses. That's a lot! And so 620R can creates amazing 620 bhp/tonne (the name is obvious). That number is practically the same as Veyron's SS! So you can expect some really fast laptimes. And top speed - 250 kph, 0-100 in just under 2.8 seconds. Blitz! The price for this toy is £50k, which is about $75k. That's a lot for a car that does not even have a roof. But if you're looking strictly on track performance, that's the best bargain.